The meeting should TAKE PLACE 19 October. German Chancellor Angela Merkel has invited the presidents of Ukraine, Russia and France for dinner in Berlin. The meeting will be held on October 19, said Russian Ambassador to France Alexander Orlov. "Yes, it is true. 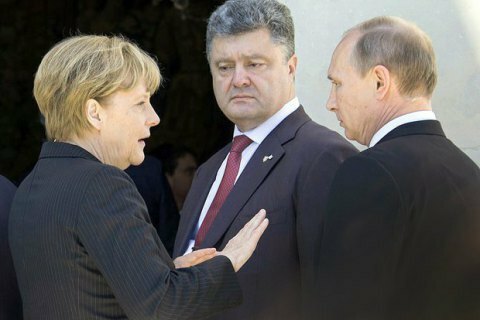 Merkel invited the three leaders of the 'Normandy format' to dinner in Berlin on October 19," he told Radio Europe 1 as quoted by Interfax-Ukraine. Earlier, Putin's aide Yuriy Ushakov said that the meeting of leaders of the "Normandy format" may take place in Berlin on 19 October. "The meeting is tentatively scheduled for October 19 in Berlin," he told reporters. Previously, it was reported that the Ukrainian side did not give consent to a meeting of the "Norman Quartet". Ukraine requires harmonization of the roadmap, which will provide for the implementation by Russia of security items in the Minsk Agreements.